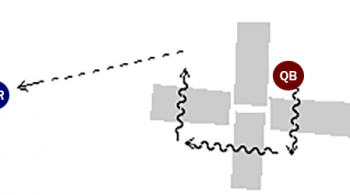 This drill is set up to give an impression of base coverages. Set up a two-high coverage using the barrels as the safeties. 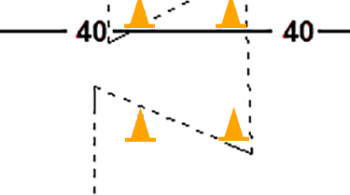 The cones are used as the underneath coverage; the corners and the linebackers. We have two receivers and two quarterbacks, so one quarterback will drop and hit the initial read which is going to be the seam route between the two deep safeties. 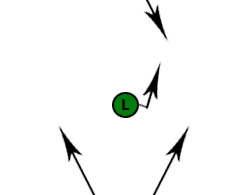 The other quarterback will take his drop, look to that route, he’ll pretend it’s covered, and then work his way to his option route which will be the slot receiver hooking up between the two linebackers. This is a good two-fold drill. 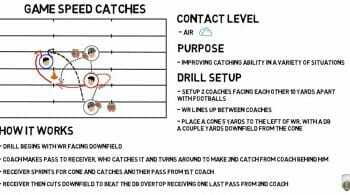 One, it allows receivers to see seams in defenses, and then also to help your quarterbacks with progression reads and to learn to catch and throw the ball in game-like or defensive-like situations. If you have a full complement of receivers and a full complement of quarterbacks, you can line all of them up and go through their one, two, three reads assigning each quarterback their read.